Ek Ladki Ko Dekha Toh Aisa Laga (lit. How I felt when I saw that girl) is a 2019 Indian Hindi-language coming-of-age film directed by Shelly Chopra Dhar. The film is produced by Vidhu Vinod Chopra under the banner of Vinod Chopra Films, and distributed by Fox Star Studios. 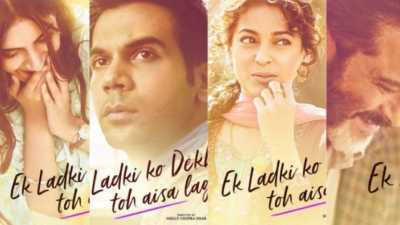 It stars Anil Kapoor, Juhi Chawla, Sonam Kapoor and Rajkummar Rao, and features Akshay Oberoi, Regina Cassandra, Brijendra Kala and Madhumalti Kapoor in supporting roles. The film follows Sweety Chaudhary, a closeted lesbian, and traces her attempts to come out to her religious and traditional Punjabi family.